Do you ever use mass transport? Spending much of my year in Europe, I am on buses, trams and trains a lot. Polish people are surprised when I tell them that outside of a few big cities and the Northeast corridor, we North Americans don’t really do public transportation. For instance, I recently told a couple colleagues about the first time I had ever been to my home city’s train station. It was this past February, to pick up visiting Amish friends. I didn’t even know where it was till then. Poles can’t believe that kind of statement. Everyone knows where the train station is, after all. What’s prompted this post is a recent article (no longer online) about Greyhound extending its service to cater to Amish in a central Kentucky town. 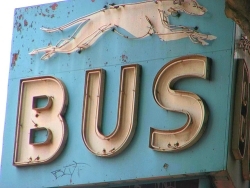 Venerable Greyhound is technically a private company–and actually under Scottish ownership, I was surprised to learn. Members of a central Kentucky Amish community have taken to using a recently opened Greyhound Lines bus stop at Sonora Farm Supply to make their way across parts of Kentucky that are too far to travel by traditional means. The stop opened March 14. Store owner George Sadler told The News-Enterprise ( http://bit.ly/J6Q9fH) members of the Amish community asked if a stop could be arranged in front of the store. Sadler says he called Greyhound the same day a stop in Elizabethtown shut down. Miller said bus line officials often don’t like to have to include small towns along their routes because there’s no guarantee there will be many riders there. “They have to realize the creek would go dry without the little runners off it,” he said. I think it’s a safe bet the Amish demographic uses trains and buses at a much higher rate than the average American. They are among the little runners keeping that creek flowing. I’ve only ridden Amtrak once. I went from Chicago to Kansas City about 10 years ago. It was a pleasant journey, though it felt a little surreal. This was probably because I was riding in a train in America. We, remember, do cars. All those beautiful, wide, well-maintained roads out there, and here I am on a train. The train was mostly empty, I recall. Still, it was hard to beat the feeling of barreling through the night past Iowa cornfields. Amish, who use trains relatively frequently, are among those who benefit from keeping rail service running. For Amish and other Plain people, many of whom don’t fly, trains can be a good option when traveling long distances. In fact, the most conservative Amish do not permit the hiring of cars. Buses and trains are really the only way for them to travel far. So I thought I’d throw it out–how much riding have you done on trains, buses, and the like? Did/do you enjoy it? 39 responses to Do you ever use mass transport? Born in Southern, PA my first memories as a child I can remember of the Amish were actually the Amish in the Philadelphia bus or train station. Of course being only a small child I could stare, one of the great things about being a child. Maybe they were not even Amish, but another group, but I do recall asking my parents a series of ‘why’ questions after that. Mark reading your comment I pictured one of the early scenes of “Witness”. I just moved to Iowa City. Bus from Bangor, Maine, to Pittsfield, Massachusetts, where I visited an old friend for a week, then Amtrak to Burlington, Iowa. It was inexpensive, fairly full, and much less hassle than an airport or driving. I had great opportunities to talk to people. I am thinking that in our new ministry, we are going to visit other church groups by bus and train. I used to take Amtrak regularly up and down the East Coast, as convenient and cheap. Bus travel becoming more popular in US? Magdalena, congrats on the move! I have to mentally geographically adjust where I think of you being now. Motor coaches are the fastest growing form of long-distance transport in the United States, and British-owned companies are leading the charge. So has the US finally learned to love the bus? I do not mean to pry Magdalena, but I would be interested in hearing your situation in relation to the Anglican church, in which you said your theology has shifted,and the Anglican church has rejected you. Growing up in the suburbs of Philadelphia, I used bus and trolly transportation when walking was out of the question. As I got older (mid to late teens) I usually had a friend with a car and the public transportation stopped being an option for me. When I moved to South Florida the public transportations was so sad that I never even attempted it. However, I recently realized that my granddaughter had never been on public transportation so I took her and her mother on a train ride to Miami. It was a fun outing that incorporated train, a “people mover”, and a bus ride. We had to be careful of the time though as the train stopped running rather early in the day and then we would have been stranded. Luckily the train was late or we would have had to grab a Taxi! It was fun for a day’s outing but not practical for us for daily use. There were apparently once a number of trolley lines running from Lancaster city into the surrounding Amish farmlands and the small towns throughout. Would be great if there was even one such historic line left, but they are long gone. Frequently used the New Orleans streetcar to go to and from school as a child, as did most of my friends. Also used it (still do) to go downtown or other places where parking is a major nuisance and expense. Rode the train to Atlanta a couple of years ago for a wedding and it was terrific fun and amazingly inexpensive and so easy; I wish there were more of them. I spent the first four years of my life in India, where we rode trains, and then when we came back to the US (this was in the late 1950s), we took the train all across the country, zigzagging all over the place to visit family, till we ended up in Oregon, where we were going to live. I still remember that trip fondly; my sister and I shared an upper Pullman berth, and we still remember the first time we saw snow out the train window (although we thought it was white sand!). But that sealed my love of trains, and since then I’ve taken the train any time I have a chance. It’s the best way to travel! Especially with children; they can stretch their legs and meet all kinds of nice substitute grandparents. So much fun. I’ve also ridden a lot of buses and, when I was working in downtown DC for a few years, I regularly rode the subway. There is no easier way to commute to work than by public transportation; you get a little mental break between work and home, without the stress! Fortunately, a lot of streetcar and light rail lines that were torn up years ago are being rebuilt in cities across the country. The Amish aren’t the only people who use public transportation — there are lots of us who feel horribly wasteful using a car, so prefer to travel in a way that is less harmful for the environment (and usually more fun). I really wish more people would take the train, so Amtrak could start making money and maybe bring their fares down. They can be two to three times as expensive as flying, unfortunately, especially if you get a better place to sleep than just a seat! But as long as there are trains, I’ll keep riding them. When we lived in Bolivia, we used public transportation for four years. Lots of stories … bus breakdowns with 3 flat tires at the same time, minivans with 25 people inside, etc. But it was cheap; you can go several hundred miles for $10. I think like Rick, above: When gas goes spiraling up some day, we North Americans will suddenly get the “brainstorm” of public transportation. But as long as we can afford it, having our personal vehicle to go when we want and stay for how long we want, at our chosen rate of speed … well, the private automobile will be Americana. Where in Bolivia did you live, PC? Was it for mission work, or just change of scenery? I spent a summer in the Alto Beni. We were clearing the jungle for homesteaders, building a church, and digging tilapia ponds (well, the women were cooking!). I was very sensitive to the high altitude of La Paz (unrelenting nausea and crushing headache), and was so relieved to come down the mountain. For those who are familiar with the area, “down the mountain” is via “Death Road,” and the typical public transportation for the poor (us included) is hitching a ride in the bed of a dump truck. Yes, I recall how (25+ yrs ago), when you met another vehicle, someone would have to go in reverse until reaching a passable spot – sometimes 1/2 mile or more…and the wooden crosses they hammered into the side of the road for those who had accidentally gone over. It’s good that they’ve made improvements. Interesting. When I was in my high school years a friend of mine and I use to use Greyhound to go into the city of Rochester shopping and then back again. When I graduated and started working in the city, I would take it back and forth to work. I guess the bus still goes into the city and back once a day but it is weird hours if you work there. Your also out of luck if you want go into the city to do something and come back right away. They just don’t use the bus around here like they use to. The first time I ever used a public transportation bus was in 1986 in San Francisco. It was the first time I’d also ever seen wheelchair accessibility on a regular bus route. If it weren’t for the hilly terrain, San Francisco would have been heaven for me. I would love the opportunity to use an accessible train. Much easier on this body than flying especially if one needs to use the facilities. Have seen and been impressed with a couple Youtube videos on Amtrak’s accessibility. Years ago, while I was living Amish, in southern Indiana, I used a bus to go to my parents place in northern Indiana. I got on the bus locally because there was a flag stop. I got off the bus at Bloomington, IN to buy my ticket. While I was paying the cashier, the first of the twin towers at the World Trade Center in NYC collapsed. It was 9/11/01. From Bloomington to Indianapolis, our bus driver kept declaring “We is at WAR”. He was ready to sign up that instant! At the Indianapolis terminal, we all sat around waiting to find out if any buses were going to move or not. There were 4 other Amish in the bus terminal with me, and we were about 10% of the people there. About an hour into the wait, the powers that be declared that the terminal had to be closed as it was federal property and they did not know if there would be more attacks on those places. Amtrak has its station at the same place, and when it closed, you never saw a man run out of a place as fast as that clerk! So, we were moved to a abandoned mall parking lot on the south side of Indy. It took about an extra 3 hours for my bus to be okay’ed to continue. On the way north, I noticed that there had been no planes in the sky, until I saw a large jet with escorts headed east. Some time later after learning what had happened and looking at a map, I guess that that was President Bush returning to Wash. from the Omaha diversion. It was amazing how abandoned the interstate was that day. I would eventually get to my parents place and find that gasoline prices had tripled or worse. My brother still won’t buy gas from the company that jacked up their prices the highest that day. In addition to what happened to the WTC on 9/11, I have a different, unique set of memories of that day. Wow, that is quite a story Lance. I rode the train as a child to go visit my grandparents. Grandpa worked for the railroad, so we got to travel for cheap! I thought it was fun as a child, as I could roam and went to get food by myself. I have only ridden the rail once. That was four years ago when I was in Seattle. It was a good ride. Not the best for my husband who has balance problems, but it was better than the taxi and other means of travel. I don’t trust the city buses, as they continue to strike. My son has been stranded many times due to the bus and rail strikes here. The public transportation is not easy for my husband who uses a walker and has a rough time getting around. Some of the buses do not have handicap access and to hard to get up and down the stairs. But its a good means of transportation for some. My grandfather would ride the grayhound bus to come visit us all the time when I was young. He refused to drive places. He relied on others with cars at times for a ride where he needed to go. Everyone here uses the Metro-North train when they go into NYC for work, shopping or shows. It is totally nuts to drive your car there if you don’t absolutely have to. The last time I rode the Greyhound was about 20 years ago, when I was coming home from northwestern PA where I’d gone to care for Mom after her surgery. Boarded the eastbound for Baltimore in Pittsburgh. The driver announced, “There will be no guns or drugs on this bus!” Whoa! My freshman year of college (1958-59) I was at U of Arizona. My parents planned to move West, were staying in Urbana, IL, where my much older military-career brother was in engineering school. I got a car ride back there with some other students at Christmas. BUT after holidays, the driver decided not to return to Tucson. I took train to Chicago and then got on cross-country train that would stop in Tucson. In NE New Mexico train had to stop because tracks ahead were covered with MUCH snow & had to wait for it to be cleared off. We were there 7-8 hours. Not much snow where we were. They let us off the train to walk around and air out the cars. Far across the sand we saw maybe a half dozen vehicles moving along highway. Then they stopped and drove across desert to us. Navajo Indians had heard of the stoppage. Came to us to sell Indian made things from rugs to other fabrics to setting up food place (wonderful fry bread) and so on. VERY friendly. Of course we all were thrilled with the food difference (train had plenty but this was an experience). I bought a thin silver bracelet that I had for years and much prized as a memory. When I wrote my parents, my mother remembered her teen years just post WWI when her parents took her to N California to attend a “finishing school” for a few months. They stayed in the area as her father had business contacts. After Christmas they took train down S thru California and then back across AZ & NM heading for Chicago. In NE New Mexico there was another train stoppage for half a day for tracks ahead to be cleared of snow. Again Navajos came but this time in horse-drawn wagons with wares and to make food. What a strange yet wonderful duplication of experience!! Do you ever use mass transportation. I am conservative Mennonite, and never used any type of mass transportation until I was in my 40’s. In the past ten years or so I have traveled three times by train, from Pittsburgh, Pa to Chicago to Temple, Tx and back home. Our son is stationed in Fort Hood, Tx. We used the family sleeper car and the grandchildren loved it. I have also gone by train from Pittsburgh to Maine and back. We have used the subways in new York and buses in Houston. While in Palm Beach , Fl we used the train to go on a outting to Miami. Now in the past five years I have flown to Houston, Tx. around 25 times. I was diagnosed with terminal cancer, not treatable in this area, I go to the big research cancer center, M. D. Anderson and am now in remission again for the third time! I must say every time we were on the train there were always Amish on it, except on down to Tx. I am a big pusher of traveling by train. Except now, I can be in Houston direct flight in three hours! And usally way cheaper! By train it was thirty two hours out of Chicago plus another twenty hours getting to Chicago and lay overs. and sometimes seems disorganized. It’s too small for the number of people who pass through there each day. I wish our country placed a higher priority on improving train travel, but I really don’t think that is going to happen. We’ll be fortunate if Amtrak can keep operating the routes they do now. My senior year of high school I was able to get out of school an hour earlier for some such reason and would always take the city bus home. The fare wasn’t even $1.00 in ’85-’86. I went to college in Boston for a couple of years and only used public transportation: the subway (T), commuter rail, and buses to come home on the weekend (GO, Peter Pan!). One time when I lived in Boston I signed up for a lifeguarding course at the Salem (MA) YMCA. My sister lived close-by and she was planning on picking me up after class. I took the Red line subway train to the Green line to get to North Station so I could catch the train to Salem. All was well until the train broke down on the outskirts of Salem…I had NO IDEA where the Y was but I followed the crowd off the train only to find out that the tracks were fenced in (tiny little chain links topped with barbed wire…the MBTA (Massachusetts Bay Transit Authority) REALLY means business). I walked along the fence looking for a place to go over (yes, I was planning on scaling the fence AND barbed wire…ahhh, youth) when I found a small spot where two fences met. I shimmied through and ran a mile to the center of Salem where I had to ask for directions to the Y. I made it to the class with moments to spare (good thing too, that instructor was one 90-year-old cranky individual and I don’t think he would have believed my story!). I have many other public transportation stories, too, some funny, some scary, some, well, just plain odd…I don’t really miss public transportation a whole lot. Growing up in Chicago, my family NEVER owned a car. We walked to the bus stop a few blocks away, at most (it depended on which direction you were traveling in). If not, we walked, because we had almost everything we needed within walking distance. I know there’ll come a day when I can no longer drive. We have minimal door to door service here, but you have to call 24 hrs. in advance, and the bus only runs a certain time of day (certainly not overnight). I WISH (like others have mentioned here) that this country would spend more on mass transportation…I’d think it would be greener, for one thing. I already had one knee replaced, and the other one isn’t in good shape, either, so I can only walk so far! I want more public transit! I’ve only ridden the train once, that I can remember. Though I am told that my mother use to take me on train trips to visit her family when I was a pre-school age. I can’t recall doing so at all. About 30 years ago my wife and I had the bright idea to take Amtrak from Houston to New Orleans in the summer time. Bad idea. Air conditioner in the coach car barely, I mean BARELY worked and it was out completely in the dining car. This was late June. Hot and humid all the way over; super unpleasant. Not near as unpleasant as the food poisoning that I got from eating a meal on the train though. Did I mention that we only took the train ONE TIME? When I was about 19 or 20 years old I took a Greyhound bus on about a 300 mile trip to join my parents, who were already on vacation. That went so poorly that I had never taken another bus trip until last August when I flew to Tulsa and then took a Greyhound to Springfield, Mo to take possession of a truck that I had purchased. 105 degrees in Tulsa when I got on the bus. Couldn’t wait to get into that refrigerated air. Alas, the air conditioner was broken on the bus too; long, hot & humid trip. I think I am done with “public transportation” for at least another 40 years and by that time I won’t care, because I will be almost 100 years old! I did have the misfortune of working in Houston for nearly 5 years starting about 20 years ago and I would carpool roughly 35 or 40 miles to the edge of the city and we would catch a “Metro” bus into downtown. Nice coaches, big comfy reclining seats and air conditioners that blew COLD air; ahhh, now THAT was public transportation worth doing & it was nice to sleep on the way in (and out)of town while the bus driver dealt with the horrendous traffic. I’ve taken the “T” into Boston a handful of times. I’m honestly not sure if I’d do it again; the only real advantage is I have a habit of getting lost *leaving* the city (I do fine driving in). It fustrates me that we can’t seem to get on a coherent game plan that recognizes and works with the strengths and weaknesses of all forms of transportation. We won’t spend the money to invest in significantly modernizing, automating, and improving our urban transit systems. Most are archaic and need to be automated so taking a commuter train or subway is like stepping onto an elevator…a modern elevator, not one of the old fashion ones with an elevator operator sitting there pushing buttons. When I look at Boston’s T, I couldn’t rely on it if I commuted into the city (I work late hours too often, and wouldn’t be able to socialize with co-workers ever after work unless I took a taxi back to my car which might be at a parking lot 40 miles outside of the city). Trains don’t run enough in the evening. They shut down entirely by midnight, which means the young folks out on the town can’t use them either. Then instead of improving what we have, we’ll spend money on studies to reintroduce train traffic into light demand routes that are best served by buses at most, or often are truly the domain where private automobiles make the most sense in dollars and time. A few years back I considered taking a train to a conference in Washington. When I looked to see what was available, Amtrak could only guarantee I’d have a power outlet on the way down, not the return. Without power to use a laptop, I might as well be driving since I couldn’t put my time to a different productive use (I don’t mind driving and find it generally relaxing). I could rent a car and pay for gas for less money then the Amtrak tickets, AND because I could drive on my own schedule instead of Amtrak’s I could be away from home fewer hours by driving. This along the very most densely populated corridor in the U.S. with our very best train. Transportation is a network and depends on the entire strength of the network to succeed — the “feeder streams” you talked about above. I don’t mind subsidizing urban mass transit and where it makes sense intercity rail (like the northeast corridor) for the same reason it’s good to subsidize very rural highways. But when I look at our public transit and rail systems, it’s like they’re not even trying to make a system that’s attractive for people to use, just one that meets the needs sort of for folks who are forced to use it. There are some very inexpensive and quite popular private intercity buses now running in the Boston-NY corridor. $20 ticket will get you from Boston to NY faster then Amtrak’s fastest train, with WiFi, and power outlets at every seat — stuff Amtrak won’t guarantee will be available, and it’s about 1/5th the price. THAT attracts people. Are you talking about the Mega-Bus, Matt? One of our relatives rode the Mega-Bus from the mid-west to the southeast U.S. and liked it. Another relative did not like the layovers in the big cities, and few connections to the small cities, travelling from the northeast to the southeast. I have taken the train across the USA quite a number of times and love to watch the scenery. Also have taken the bus from Maine to Boston several times. I only fly when there are no other options. I’d like to hear sometime how you ended up spending so much of the time in Poland. Hi David, my parents are from Poland originally–my mother grew up here and my father’s family lived here as well. I spend time in Poland as well as the States during the year. My grandmother and other family are in Warsaw. I spend most of my time in Eastern Europe where I use public transportation nearly exclusively. It definitely has advantages (no hassle with traffic police, no hunting for parking spots, no maintenance) but it is also a hassle in many ways. Long distance travel is exhausting for me as the train schedules in ‘my’ country are geared to overnight trips… and I have a difficult time sleeping on trains. Sleeping on a bus, of course, is worse. 🙂 I also tend to stress about getting there before the train/bus leaves. I’ve been home in the US the past 9 months and it has been a real treat to have a back seat and a trunk and a car whose doors lock and I have the key! I took one Amtrak trip about 20 years ago- from Indiana to Maine. The novelty of it made it absolutely worth it! Loved the observation car. When I was a teenager I used the bus to go to work and get around, and also to go to Atlantic City and Ocean City to hang out. Then, when I started going to England with my cousin we always used the busses & trains to get around, and it wasn’t until I met my future husband over there that we finally got to drive around in his car. For my 50th birthday my husband took me to the south of France where we explored all over and took a daytrip to Italy all by busses and trains. I think mass transportation is alot more available and easily accessible in Europe than it is here. We’ve become so reliant on our cars that everything’s been spaced so far apart and made it impossible to walk to or get to easily, and even public transport only follows the main roads and makes it hard for some tucked into the suburbs or out in the countryside to get to. I do love the trains, though, and hope they won’t disappear anytime soon. I cannot stand flying, though it is required of me from time to time. I love long road trips, but I love even more being able to sit back and relax when I’m traveling. I’ve only taken Amtrak a few times, but it is the most amazing travel experience I have ever had. I’ve only traveled on it in the south, so I’m sure it is completely different in the northeast and on the west coast. I’ve taken Greyhound cross country a few times and there was a time I really enjoyed it. That ended after a man sitting in the aisle across from me started stabbing the man sitting next to him. I hopped off on the next possible stop and took Amtrak the rest of the way home. I wish high speed rail and more old style, formal trains were options in the US. I’d take both whenever possible. I have only once taken the bus long distance. Coming home from college at the end of my freshman year. It was long and crowded and awful. I used to take the bus home from high school occasionally when it felt too hot to walk the 2 miles home, but that was filled with students and felt more like a school bus. I live in So. California and we joke that mass transit is for those who can’t afford a car yet. I just realized that my 12 yr old son has never been on any public/mass transit. Now that gas is so high, we just ride our bikes. Even if we are going 5-10 miles away we can get there faster on bike than our awful busing system. I love road trips and much prefer having my own car. Not ready to use mass transit anytime soon. Leave a reply to Do you ever use mass transport?